Are you looking for great rental investment properties for sale in Ocean City NJ? "America's greatest family resort" is exactly why you should invest in Ocean City. Every year millions of people return to the beach. If you grew up in the tri-state area everyone visits the beach for a vacation during the summer. What makes Ocean City great is there are no liquor stores or bars on the island but only a swim across the bay away. They have one of the greatest boardwalks in the world with plenty of family oriented shops and activities. 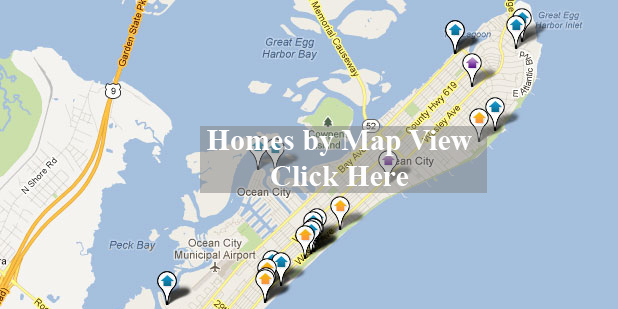 If you think Ocean City is for you then click on the map above to view these great investment properties. Homes for sale in Ocean City is our specialty. Above are just a few of the newest great rental investment homes to hit the market. Our website provides you the ability to view all active listings in Ocean City, Strathmere, Sea Isle City, Avalon, Stone Harbor, Wildwood, and Cape May. The site is easy to use for all your property search needs. Featuring the best foreclosures, bank owned homes, land, and homes for sale at the Jersey Shore. Contact us! Sign up to the right to receive free daily email alerts as they hit the market.